Soho Grifter Anna Delvey Hired a Courtroom Stylist... Who Is Paying for It? 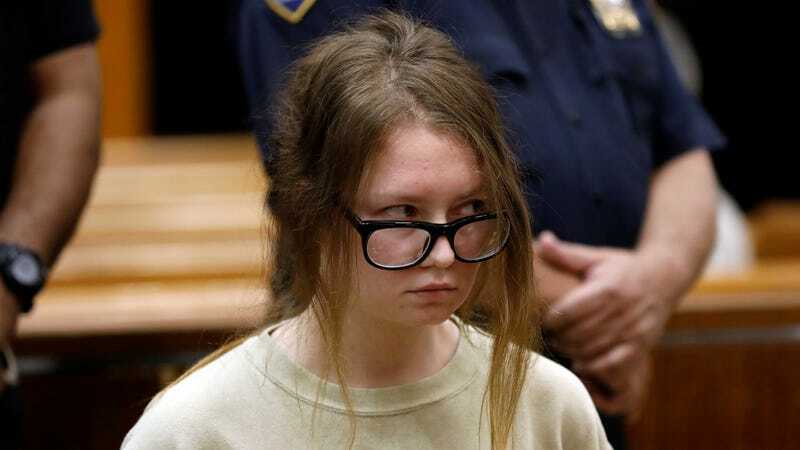 Anna Delvey, neé Anna Sorokin, swindled her way to New York socialite status by posing as a German heiress for the better part of four years. In October 2017, her gratuitous spending on lavish vacations and extended stays in luxury hotels despite not actually having a fortune led to charges of grand larceny and theft of services totaling $275,000. Since then, the “Soho Grifter,” as she has been dubbed, is being held without bond at Rikers Island. However, on Wednesday, Delvey appeared in court to begin her trial in a rather fashionable, expensive ensemble: a black choker, a black dress (which is either a Miu Miu gown, if you believe the New York Post, or a Michael Kors shift dress, if you’re more inclined to follow the Instagram account AnnaDelveyCourtLooks), her classic thick black Céline frames and black flats to keep up appearances. Some very pertinent questions: How did she get such chic clothing while in jail? Who is paying for it? And just how far does this scam go? Scams of the Day, Ranked!